What is the Healthiest Mayo to Eat? Looking for the best mayonnaise became a little bit of an obsession for a while. It went on for over a month or more. That may sound a little long but if you have to be that strict for health reasons you know what I am talking about it. You can also go a little crazy about ingredients. It’s tough out there being a food vigilante. Either because you have food sensitivities/allergies or you are trying to buy the most nutritionally sound and healthy product like me. Store bought food is highly processed and a lot of so-called healthy options are really not that healthy. One problem with mayonnaise altogether is that is made with vegetable oils like soybean, corn, canola or safflower. These are all high in the essential fatty acid omega-6 which we have way too much of in our diet. Having too much omega-6 oil in our diet leads to inflammation. We do need to eat it but in a much less amount and increase our omega-3 consumption to balance things out. I highly recommend you read this excellent article to understand further the importance of omega-6 and omega-3 essential fatty acids in our diets. I’m wasn’t even buying mayonnaise for the typical sandwich making. I was looking for a spread. Something easy to use as a veggie dip or generally dress up the regular eating of vegetables and proteins. I was about to make it myself. In the end probably that is what I will do. That way I can control the oil it is made with and use olive. Olive oil still has omega-6 but it’s content is much lower than other vegetable oils and has some additional health benefits. 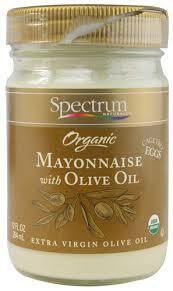 There’s an olive oil mayonnaise by Spectrum but it’s not purely olive oil. It has soybean oil in it. How do we know what percentage is olive oil and which is soybean oil? Honestly I feel a little bit duped. Soybean oil is much cheaper than olive oil so that is probably one reason they added it. Soybean oil is one of biggest culprits in the over abundance of pro-inflammatory omega 6 fats in the standard American diet and eating soy foods raises a multitude of issues (see below) so it cancels out the fact that is an olive oil mayonnaise. Otherwise I would be down. I recently stopped eating eggs so that narrowed my mayo choices even further. Miso mayo is one of my favorite spreads in this category and it works great as a mayo. This is the one I want to try to make my own version of. I love the miso flavor and I always have light miso on hand. But I am going to make my own rather than purchase it because it contains canola oil as the main ingredient. I try not to eat much canola oil, even if it is organic and expeller-pressed such as in miso mayo. Canola oil has omega-6 but it’s problematic beyond that. It’s a hybrid (not a GMO) of the rapeseed plant. They bred out the potentially dangerous erucic acid (causes heart lesions in rats) and it became an industry. But canola oil can still have up to 2% erucic acid in it and unless it is organic and expeller pressed, it’s been bleached, de-gummed and sprayed with Round-up. Absolutely do not eat mass-market supermarket canola oil. 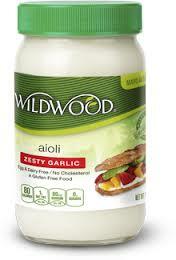 Wildwood garlic aioli is pretty tasty and like dipping raw veggies in it. But it’s made with canola oil and soy protein so I realized it’s not something I want to use regularly. Soy is quite controversial as there are many possible issues with soy from allergies to GMO’s and effecting male and female hormones. It is generally believed by health experts if you are going to eat soy, consume it in its fermented state such as miso, tempeh and natto. Which brings me to the vegenaise and the Follow Your Heart brand of mayos. It’s a vegetarian product so it must be healthy right? It’s an egg free mayo but not so fast. Original veganaise is made with canola oil and soy protein. Nix that one. I considered the grapeseed oil version of vegenaise but it also has soy protein in it. I had just about given up on vegenaise and mayonnaise altogether until I found the soy-free version at a particular store. This one is made with pea protein instead of soy. I was pretty stoked and thought my days of looking were over. 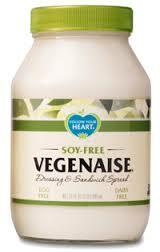 Vegenaise soy-free does a decent job but it needs more flavor. I think maybe I don’t really need a mayonnaise after all. I want to experiment with making olive pate and onion butter. There was a lemon, olive oil aioli made in Spain at the coop but it was $7 for a small container. I get plenty of fat in my diet from coconut oil, avocados, fish and fish oil, nuts and nut butters. But I gotta be mindful of those too–avocados and nuts are loaded with omega-6. A lot of people don’t realize this and think that avocados and nuts are healthy. But if you are consuming mayonnaise, cooking in canola or safflower oil, eating nuts, meat and consuming no omega-3 fish or fish oil then you can end up with a pro-inflammatory diet even if though it might seem like you are eating quite healthy. The simple answer is that a vegan diet points to less disease and health issues. Oh, I see. If you’re a vegan, is it sometimes difficult to do your job if you’re selling non-vegan products?